A worksheet to work some expressions with the verbs make, do, have and get. 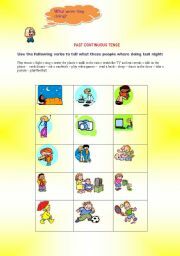 The students will have to use the proper verb, right tense and match the sentences with the right pictures. Answers have been included. Hope you find it useful! 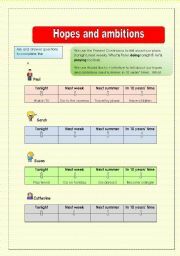 Students are going to ask and answer questions to complete the fact sheets about the plans (using the Present Continuous) and hopes and ambitions (using would) of four different people. Some cards to practise the present perfect and the use of for and since. 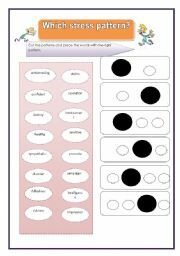 A different activity to practise stress patterns on words. B&W version included and key for the teacher.I hope you find it useful. Thank you! 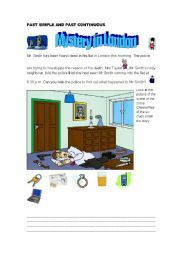 Activity to write a story usint the past simple, past continuous and their imagination! What were they doing last night? Speaking and writing skills, practising the past continuous tense. 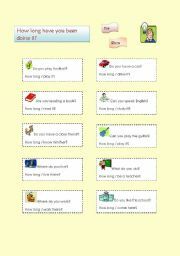 Worksheet for the youngest to revise vocabulary back to school or to learn new vocabulary. A powerpoint where students can revise members of the family, professions, hobbies and adjectives to describe personalities. There is a task added in the last slide for the students to work. Some pictures in powerpoint for the students to make sentences and describe what these people are doing at that time.